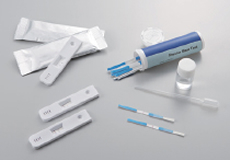 In addition to the gold colloid manufacturing technologies it has built up over a number of years, TANAKA has at its disposal every possible technology relating to the highest performance immunochromatographic diagnostic test kits. These technologies include those which allow proteins to bind to gold colloids, prevent non-specific absorption of proteins by gold colloids, and promote antigen-antibody reactions. 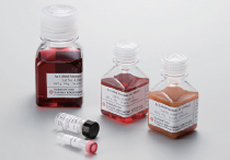 TANAKA not only supplies raw materials for in-vitro diagnostic test kits, but also manufactures them on an original equipment manufacturer (OEM) basis under a reliable production system managed in accordance with the ISO 13485 system. If antigens (such as virus antigens) are present in a specimen, gold colloids bind to the gold colloid-labeled antibodies to form composite bodies. The composite bodies then pass through a membrane as a result of the capillary action and bind to the capture antibodies that are immobilized in the detection area. These then appear as a red band. This principle is used to determine whether antigens are present or not.